After the flood, Noah went out from the ark with his three sons Shem, Ham, and Japheth. Ham is the youngest son of Noah. The earth was then populated with people through the off springs and descendants of Shem, Ham and Japheth. From these, the people on the earth were divided. After the flood, Noah became a farmer and he planted a vineyard. From the vineyard, Noah made himself some wine. Noah drank the wine and got drunk and lay naked in his own tent. 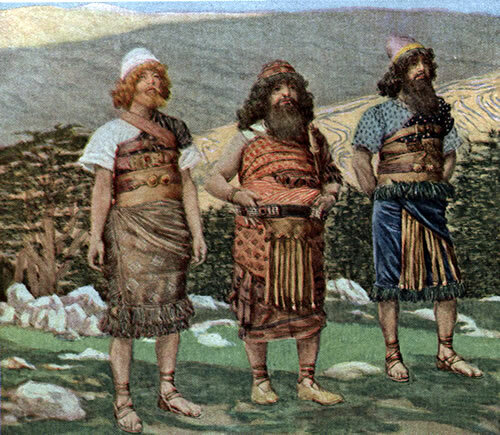 When his youngest son, Ham saw that his father is naked and not wearing any clothes, he was ashamed of it and went out to call his two older brothers Shem and Japheth to cover their father. And so Shem and Japheth took a garment and went backward to cover Noah so that they will not see Noah’s nakedness. When Noah knew that Ham had done this, he cursed his son Ham. Noah cursed that Ham and his offspring and descendants will always be the servants of his two brothers Shem and Japheth. But Noah blessed Shem and Japheth that God will keep enlarging their territories and that Ham and his descendants will serve them forever. After the flood, Noah lives for another three hundred fifty years. When Noah reaches nine hundred fifty years old, he died. Ham has a son called Cush. Later Cush became the father of Nimrod. Nimrod is a mighty hunter. And therefore there is a saying,” Like Nimrod, God’s mighty hunter”. Shem became the grandfather of Abraham. Noah not God cursed the son of Ham, Canaan. God did not curse Ham, as a matter of fact, God had previously blessed Ham. Ham and his descendants were not cursed only Canaan that is why God promised Abraham Canaan i.e the promised land. This act fulfilled the curse of Noah upon Canaan and thus his descendants were eventually absorbed into other nations. Ultimately this absorption is the fate of all. The curse of Ham is certainly a misnomer in that you are correct, the Bible tells us that Noah cursed Canaan not Ham. Equally, your observation that the curse is fulfilled in God’s promise to Abraham seems valid, what was once Canaan’s land now becomes the promised land. But the absorption to which you refer does not feature in the Bible as our fate. The Bible teaches placing our trust in Jesus gives us everlasting life in him, entering into his kingdom through working out our salvation through the Holy Spirit now, and eternal joy with him after death.